Your body needs iron to make blood cells. Without iron, your body would not be able to produce or carry many proteins that are essential for blood cells. You may need an iron supplement if you develop an iron deficiency such as anemia. 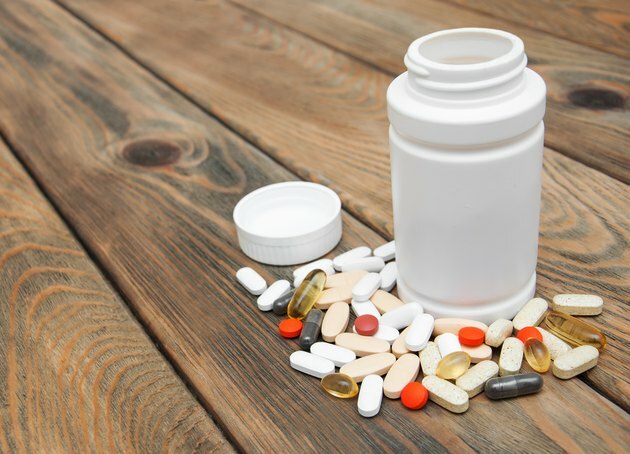 Never take supplements or vitamins without consulting your health-care provider. Taking too much iron can make you sick and cause you to develop low blood pressure, a weak pulse, fever, headache, chills, dizziness and a buildup of fluid in your lungs. You may suffer from a coma, but this typically occurs within 30 to 60 minutes after an overdose, according to Medline Plus. This is you should take iron supplements only under the care of a licensed health-care provider. If you suffer from hemochromatosis, a hereditary condition that causes your body to absorb too much iron, your body stores excessive amounts of iron in organs such as your heart, liver and pancreas. This can lead to cancer, liver disease and heart problems. The recommended daily allowance set by the Food and Nutrition Board at the Institute of Medicine for iron is 8 milligrams per day for men and 18 milligrams per day for women. Women require more iron than men due to menstrual cycles and the need to create and replace blood cells. Your needs may vary from the recommended daily allowance. Ask your doctor what's right for you. Most Americans receive an adequate amount of iron from food alone, but for those who may have a poor diet or a diet that lacks iron-rich foods, supplements may be the answer. Iron is obtained from foods such as raisins, prunes, beans, seeds, green vegetables and whole grains. If you're not obtaining an adequate amount of iron from foods, you may opt for an iron supplement. Meat is also a source of iron. Before using iron supplements or any other supplements, consult with your physician. Iron supplements are available as capsules, tablets and other various forms. Since most Americans receive plenty of iron from diet alone, your doctor may test your iron levels by obtaining a blood sample. If your iron is within a healthy range, your physician may advise against taking iron supplements. If you have hemochromatosis, your doctor may also advise against taking iron supplements since the results can be toxic. MedlinePlus.com reports that iron supplements may cause stomach upset and nausea if you are taking too much of them. If you have an iron deficiency, talk to your health-care provider about incorporating more iron-rich foods into your diet, and ask how much iron your body needs.